Soon after Jackie and I met, we “accidentally” discovered that by combining our talents/skills/knowledge/aptitudes, we could make ceramic tile. After much research, trial and error, humorous and spectacularly unsuccessful attempts at moldmaking, and then finally producing a collection of about a dozen designs (we now have over 300), we launched a handmade tile business in 1995. I worked full time at it until it was built up enough for Jackie to quit her outside sales job and join me making our fledgling line of hand-pressed, bas relief tile. The business grew fast, we moved to an industrial space, had six kilns running on three-phase power, up to 11 part-time employees, and … found that we didn’t have time to make art anymore. We thought a larger company could take our tiles to the “next level,” so in 2000 we approached a corporation we had done a lot of business with about the idea of teaching them how to make tile. They said yes, so we licensed our designs to them (we owned the designs, they had exclusive rights to produce them), they made our tile line, and gave us a royalty on every tile. I found out by a chance phone call that they were going to cease making tile five weeks from that day. Did I mention it was unexpected?!? This was about a year and a half ago, right when I was on fire artistically … felt I was ready to make some moves … on the verge of putting myself out there in a bigger way. But then we got the news about tiles, our beloved tiles, our future income forever till we’re wrinkly all over tiles. On the one hand we were happy and relieved to get “our baby” back under our control once again, but it meant changing our lives entirely and abruptly. So I immediately swallowed my artist self whole in an instant. He didn’t have time to utter a word, because I put him in head first and gulped. It was brutal, but that’s what I did. I literally hacked up and threw away a major work in progress since time was of the essence if we were going to jump start a national handmade tile business from scratch in just five weeks! We also needed space and lots of it. We looked briefly at industrial spaces, but decided it might be “safer” financially (prophetically, looking back) to shoehorn tile operations into our existing studio space. So I gave up every square inch of my former sculpting space to tiles. We hired and trained people, hired electricians to max out our incoming electrical capacity, bought and wired kilns, made hundreds of tile molds, bought dozens of gallons of glazes and began the arduous process of glaze testing/matching, and on July 1 of 2008 we started producing orders for our dealers all over the country. The first few months weren’t pretty, but our employees/artisans did a fantastic job of hanging in there and learning and improving to the point that now they have taken our tile line to a new level of quality and beauty beyond our expectations. They’ve raised the bar to the point that I can’t even press a “good enough” tile anymore, not for this crew! Now, when an order comes in, I have confidence in our team to take it and run with it, and know they’ll do a great job. It has been a huge undertaking maneuvering the business to this point of efficiency/competence, but the reward is that my day to day involvement has gradually become less necessary. We had exceptionally good tile orders last August, and decided to re-invest the profits into more studio and storage space. So we had a local contractor build a brand new 14 x 20 studio for Jackie and a 12 x 16 first class storage barn on a slab. I was very involved in the construction, wiring, painting and so on for most of the fall … it was fun, actually! And then, after everything and everybody else seemed to be pretty well taken care of and humming along relatively smoothly, I began re-organizing, discarding and efficientizing (hey, it’s my blog, I can make up words) to re-claim a 10 x 10 foot corner of my former studio space just for me, just for sculpting. 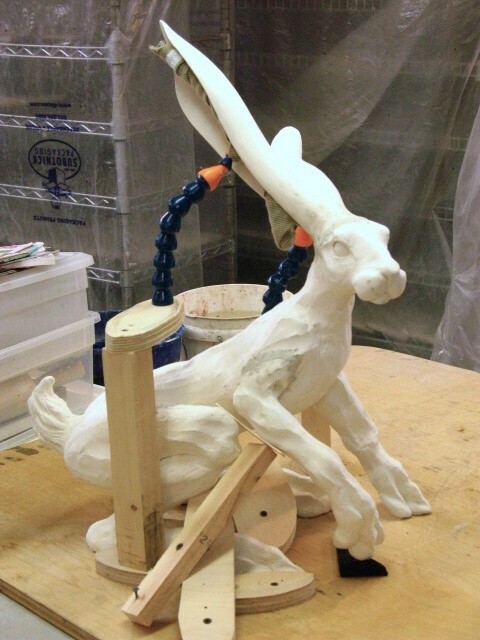 When tiles returned to us out of the blue, I thought I might never have time and space to sculpt again … which has served to make me appreciate all the more deeply the opportunity to resume making large-scale ceramic sculpture once again. 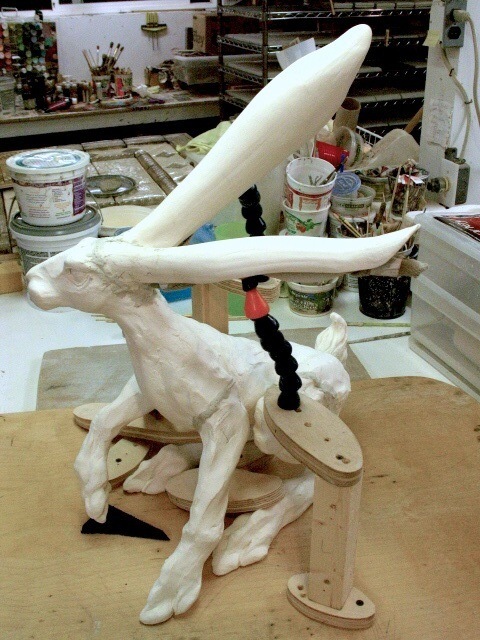 Hence the name of the first piece I sculpted in my new space — “Reprieve” — of a hare that had been stoically sitting in the same position day in and day out, ears limp, eyes unfocused and gazing forward at nothing. Told you it was a long story.